SEM resolution is tested in terms of a combination of criteria, namely resolved gaps and the number of gray levels in the image. This is to ensure that the resolution has not been distorted by using the contrast to maximize visibility of edges. High resolution images ideally should show fine detail together with a lack of noise evidenced by a good range of gray levels. For resolution test of SE and BSE imaging and also for chemical mapping in high-resolution systems such as an Auger scanning instrument. Each test specimen has a square grid pattern with large crystals in the center of each square, and very fine crystals at the edges of each grid. Thus medium and high resolution gap tests are performed on the same specimen. Meantime, the larger crystals show facets which allow an assessment of the gray level reproduction available at high resolution. Gold particle range from 5nm to 150 nm approximately. For very high resolution performance testing this specimen has a smaller gold particle size ranging from <3 nm to 50 nm as compared to the high resolution test above. Ideal for testing at instrument magnifications of 50,000x and above. 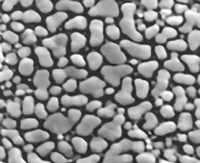 With gold particles ranging from <2nm to 30nm, this test is suitable for ultra high resolution SEM tests such as field emission electron source. A magnification of at least 80,000x is required for this test. Larger gold particles in this test allow for a higher contrast and smaller gaps allow resolution to be measured. This helps to make the test easier to use when operating conditions are not optimal. Larger gold particles in this test with wider gaps, allow for structured microscope setup. Magnification is 800-10,000x. The various spacings created by the dendritic structure give the gap test, and the topographical arrangement of the dendrites leads to the gray level test. The specimen is non-magnetic, vacuum clean. It is most useful for working in the probe size range of 25 to 75 nm. Supplied unmounted. Tin on Carbon is an alternate test specimen for medium resolution, and for the daily basic checking of your instrument performance. This specimen consists of a dispersion of tin spheres, within the size range 10 - 40 nm, on a carbon substrate. Ideal for astigmatism correction, it is also recommended for use in SEMs employed in the semi-conductor industry where the usual gold on carbon specimen cannot be used because of the risk of gold poisoning. This high magnification test is supported by a grid with tin dispersion over a carbon substrate. Range is about 3 - 60nm. The tin spheres are easily found on the grid. The grid allows the test to be level with the tin spheres. This low magnification test has a size range of 1 - 10μm for table-top SEM. Has a magnification range of 250-5,000x. Can be used on FESEM and FIB as well.